I LOVE candles – but I hate the expensive price tag that many of them come with! I started doing some research on how to make homemade candles and found out that the supplies can be even more expensive to buy and make your own. So – off to the Dollar Store I went – hoping to find some inexpensive wax to make my own candles. I was so excited to find packages of Emergency Candles for only $1.00. There are 6 un-scented candles per package and I figured that I could make around 4 candles from these two packages. 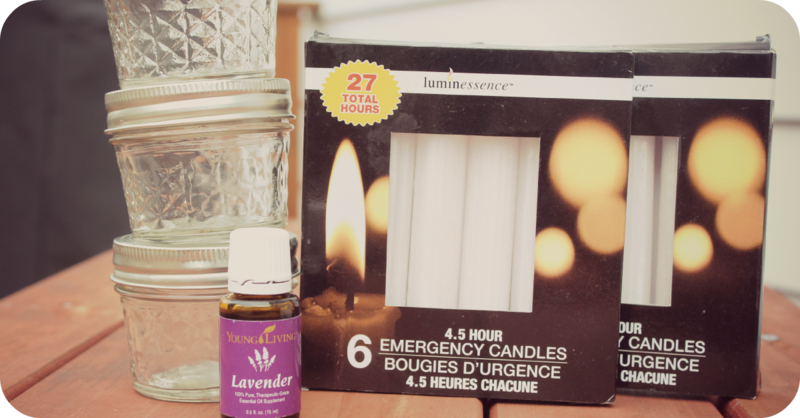 To add scent to the candles I added Lavender Essential Oils (I use Young Living brand). I first started off by creating a double broiler with two pots, you will want to do this so that your wax melts and does not burn. You can do this by adding about an inch of water to the bottom pot and turning it on high, then place the other pot on top and place your candles inside so they can start melting. 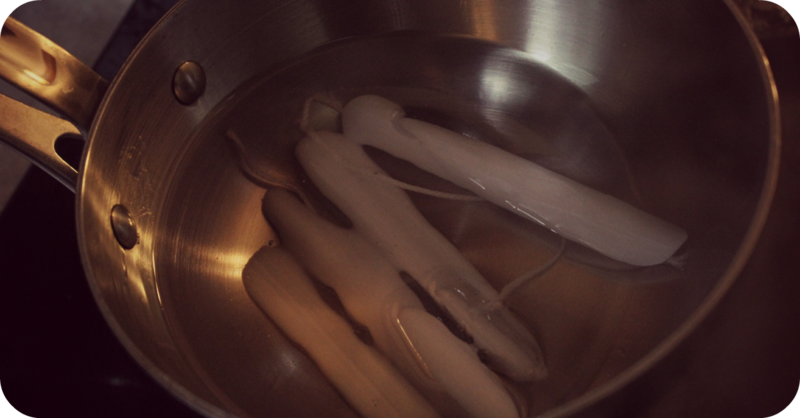 You will see that once the candles start melting the wics become easy to remove, I melted four candles at once. 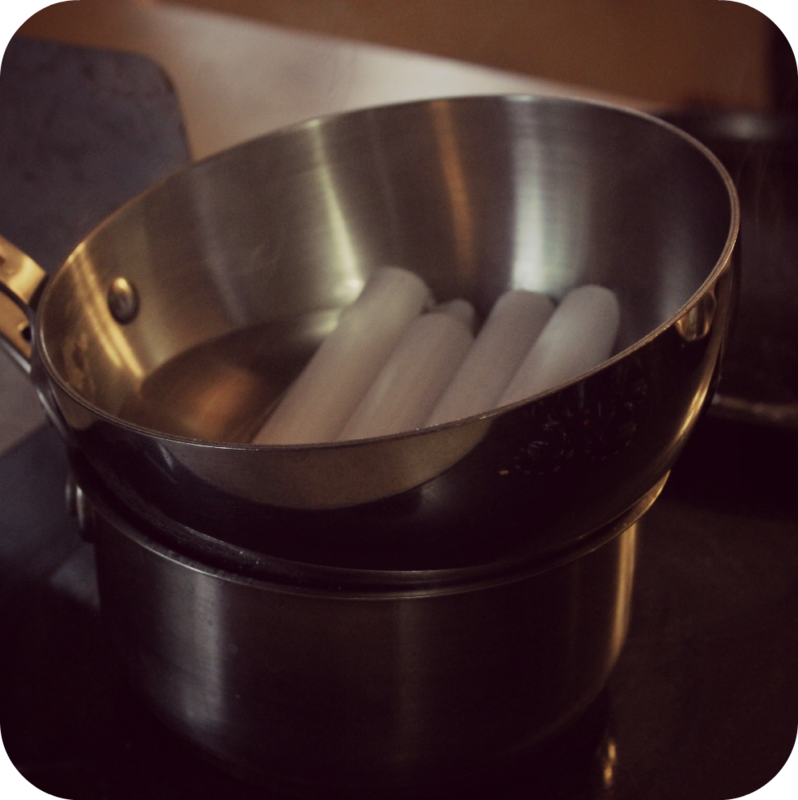 Once the candles are most of the way melted, I took the wics out of the wax with some kitchen tongs. Then let them dry on the counter. 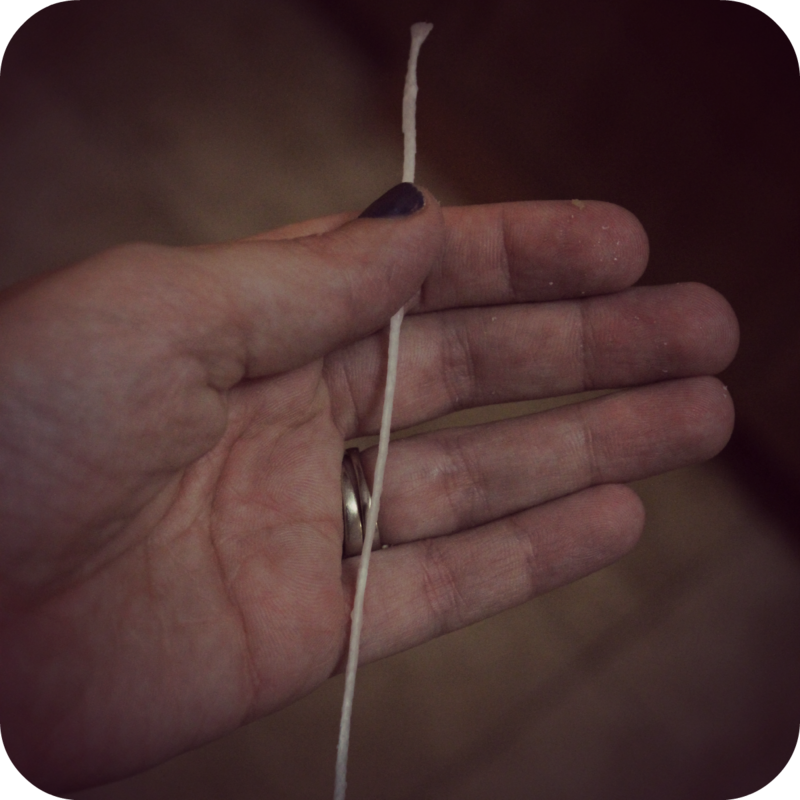 I peeled off all of the excess wax and straightened them out – then set them aside until later. My wax is all melted now – so you have to quickly do the next steps before it starts to harden. 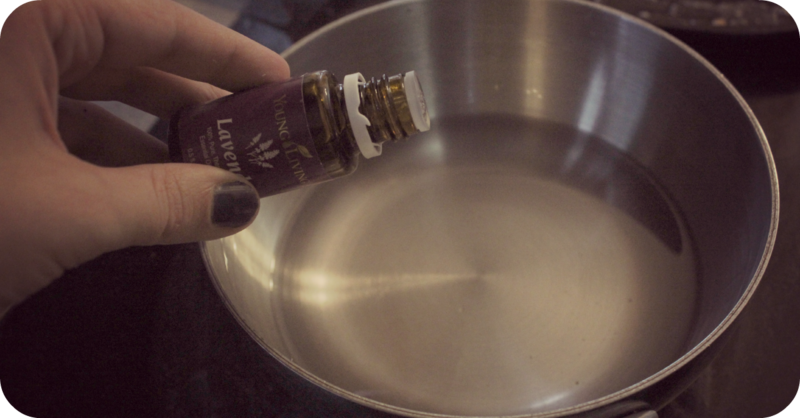 This is where you will add your essential oils. I used Lavender because I LOVE that scent – but you could choose others if you want. I added about 40 drops to the 4 melted candles in this batch – you can add more or less depending on the strength you want. I then gathered my 4 oz Mason Jars that I purchased for around $10.00 for the entire case (12 included). 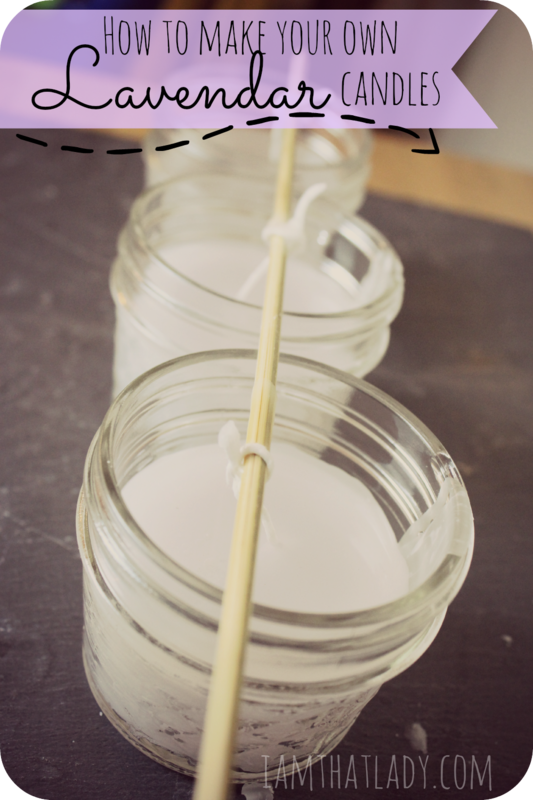 I then took a shish-kabob skewer from around my house, tied the dried wics around them, cut them to the length needed to just touch the bottoms of the jar, and voila – they are ready for the wax. 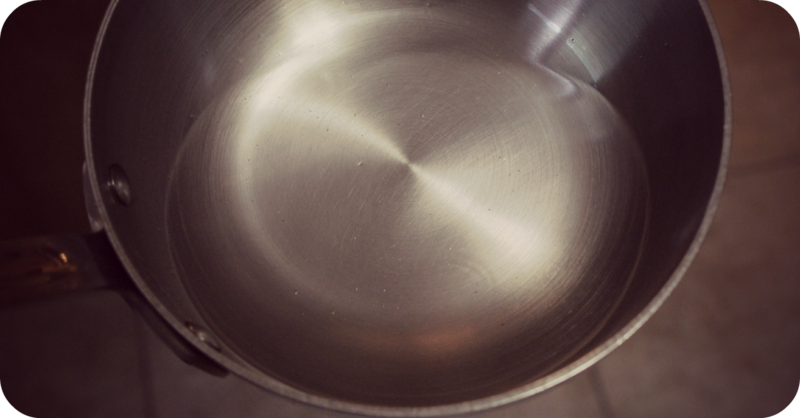 Once you take the wax out of the hot pan, you have about 15 seconds until it starts to harden. 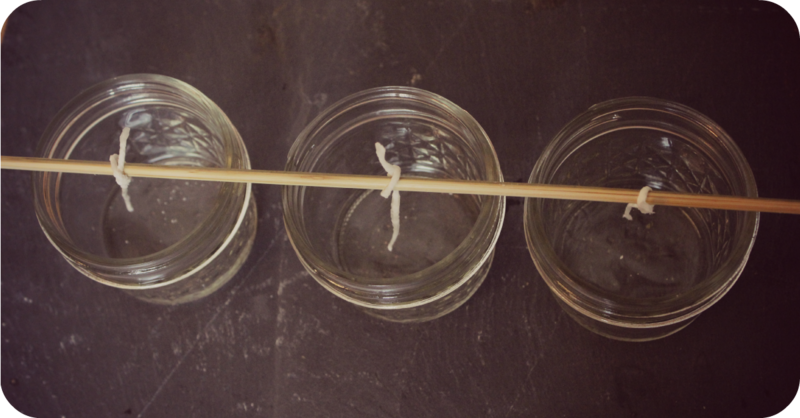 Carefully pour the wax into the mason jars, and there you have it. You should be able to make 4-5 candles for each box of candles you melt down. If you see a little dip in the wax by where the wic sticks out, once the wax is cooled add a little bit more melted wax to fill in the holes. This should give you a nice flat candle. These make perfect gifts, or just a cheaper alternative to buying candles. 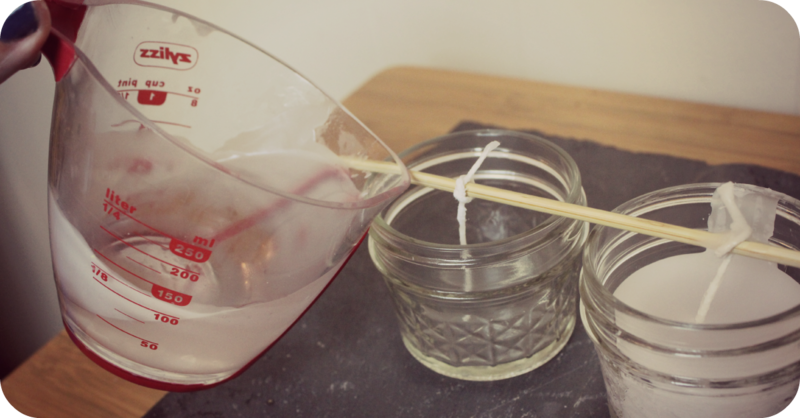 I was just looking for a way to remove the wax from my used candle jars so I could use them to make something else. 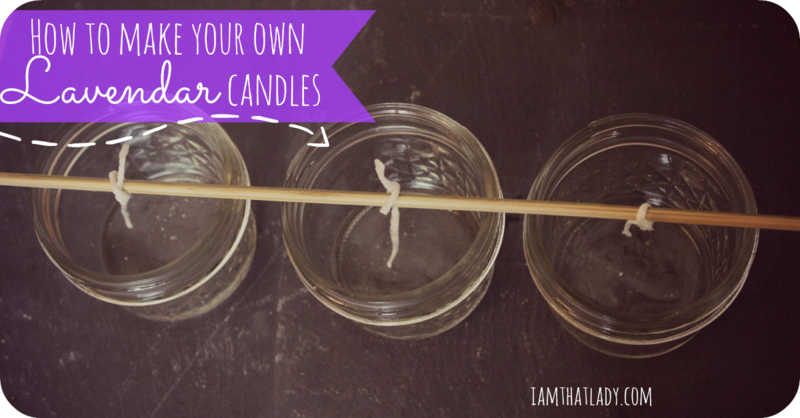 But I ran across you pin for making your own Lavender candles here on Pinterest, and I had to stop and check it out. I too love the smell of Lavender, and it is such a relaxing, calming scent. Now, I’m going to make myself some Lavender candles. Thank you for your tips on how to do it. Can’t wait to see and smell mine. Thanks for sharing.